American judges of the OMGUS Military Tribunals, hearing the trials of German war criminals at Nurnberg, are shown at the bench of the main courtroom of the Nurnberg Palace of Justice. They are: (front row, left to right) Judge Edward F. Carter, Lincoln, Nebr. (Tribunal V, Southeast Generals Case); Judge J. T. Crawford, Ada, Okla. (Tribunal I, Race and Resettlement Case); Presiding Judge Lee B. Wyatt, LaGrange, Ga. (Tribunal I); Presiding Judge Michael A. Musmanno, Pittsburgh, Penna. (Tribunal II, Einsatzgruppen Case); Presiding Judge H.C. Anderson, Jackson, Tenn. (Tribunal III, Krupp Case); Presiding Judge Curtis G. Shake, Vincennes, Ind. (Tribunal VI, Farben Case); Presiding Judge Charles F. Wennerstrum, Chariton, Iowa (Tribunal V, Southeast Generals or Hostage Case); Presiding Judge William C. Christianson, Red Wing, Minn. (Tribunal IV, Ministries Case); Judge Winfield B. Hale, Rogersville, Tenn. (Tribunal V); Judge William J. Wilkins, Seattle Wash. (Tribunal III); Judge John J. Speight, Dothan, Ala. (Tribunal II); Judge Daniel T. O'Connell, Newton, Mass. 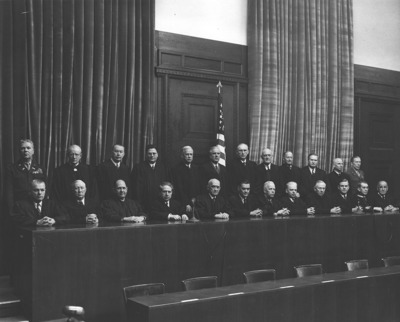 (Tribunal I); Back row, left to right - Col. John E. Ray, San Antonio, Texas, Secretary General to the Tribunals; Judge Robert F. Maguire, Portland, Ore. (Tribunal IV); Judge Edward M. Daly, Hartford, Conn. (Tribunal III); Judge Paul M. Hebert, Baton Rouge, La. (Tribunal VI); Judge Clarence F. Merrill, Indianapolis, Ind. (Alternate Judge, Tribunal VI); Judge Richard D. Dixon, Edenton, N.C. (Tribunal II); Judge James M. Morris, Bismark, N.D. (Tribunal VI); Judge George J. Burke, Ann Arbor, Mich, (Tribunal V); Presiding Judge John C. Young, Colorado Springs, Colo. (Tribunal V, High Command Case); Judge Leon W. Powers, Denison, Iowa (Tribunal IV); Judge Justin W. Harding, Franklin, Ohio (Tribunal V); and Col. Samuel L. Metcalfe, Austin, Texas, Marshal of the court.